Open-hatch, multi-purpose cargo ship; 19,222 gt; 29,455 dwt. 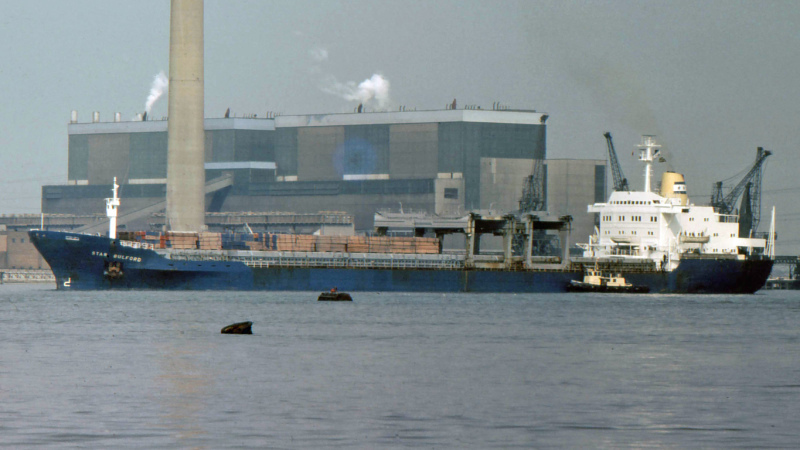 Operated under the British flag, in the Bergen-based Star Shipping pool, by Blandford Shipping Co Ltd, London (an associate company of Fred Olsen, Oslo, Norway). Built: 1969 by Cammell, Laird & Co (Shipbuilders & Engineers) Ltd, Birkenhead, UK. Yard no. 1333. Propulsion: 2 x 12-cylinder, four-stroke MAN V6V40/54 medium-speed diesels of 13,040 bhp (total) at 353 rpm, geared to a single screw shaft. Built for Wm France, Fenwick & Co Ltd, London as STAR PINEWOOD; 1974- STAR BULFORD (as photo). 1982-renamed STAR SUNG (Hong Kong/British flag) same operator; managers Stamford Shipping Co. 1984-SLEEPING BEAUTY; 1987-SEVEN SEAS.